Which societies were the first farmers? When and where did they emerge? Early civilizations in the Fertile Crescent of Middle East or in China about 9000 BC? Or maybe ancient people in Solomon Islands or in the Highlands of New Guinea? No, social insects like ants and termites were the first farmers on land; leaf-cutter ants began cultivating a fungus species about 50 million years ago! How about the domestication of animals? Which societies were the first breeders and shepherds? So, these ancient people were the first animal breeders? Wrong! Farmer ants keep domesticated aphids (small herbivorous insects) for their sugary honeydew since millions of years. In fact, with their workers, soldiers, baby sitters, site builders, leaf-cutters and fungus nurses ants were among the first industrial societies. Whereas we humans have education and indoctrination for the definition of roles in the economic life, ants have their genetic imprinting. Both systems work perfectly! Due to all these wonderful traits ant “ika” (a worker ant named ika or shortly “ant ika”) is the nickname we have chosen for the upcoming feature for our .net libraries finaquant protos and finaquant calcs, namely calculation node. 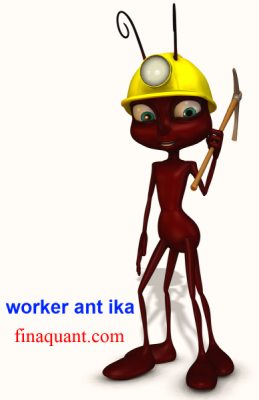 Our worker ant ika doesn’t live in forests, grasslands or deserts; it lives in the computers of our users. Ant ika never complains or rebels; it works and toils tirelessly on the assigned duty for perfection. Ant ika is never bored of routine work; it never questions its job, or looks for a change. Ant ika can co-operate with other ants, and build highly efficient superorganisms (calculation networks in our case). Ant ika have many legs (in fact 3 pairs) that can symbolize arrows for input and output tables. A calculation node encapsulates a high-level table function (also called node function) with a number of input and output parameters. Note that all these parameters are tables without an exception. Once configured properly a calculation node fetches all the required inputs from the database, executes the assigned table function to generate output tables and writes them into the database. 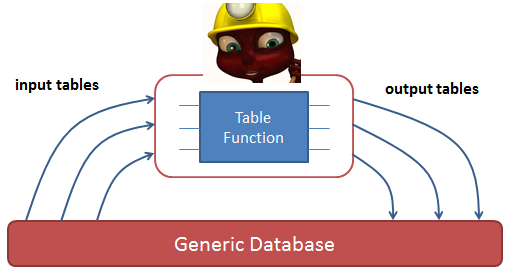 Ant ika has the ability to calculate and store all the table valued parameters of multiple calculation instances. For example you may want to execute a table function for every month and country for calculating some price estimations. No problem for ant ika! It fetches all the inputs from the databases you want, executes its table function and writes the results to the databases you want, together with the instance information month and country. Quite useful feature if you need periodic or multidimensional table calculations. With the addition of calculation node as a new feature (presumably until May 2013) finaquant® protos will be more than a library with table functions; it will become a real calculation engine based on table functions. The whole range of table functions in the library can be used to formulate high-level node functions. What sort of analytical problems can be solved with calculation nodes? Well, considering the holistic approach of finaquant libraries to numerical computation with its table valued parameters, the question must rather be asked the other way around: Which problems can’t be solved with calculation nodes? Possible application areas include estimations and forecasts based on historical data, scenario analysis, simulations and optimizations, fee and commission calculations for provider-dealer networks, strategic financial planning, reporting and so on. As already mentioned above, calculation nodes (worker ants) can cooperate to build calculation networks. The output of a node can be input for another node in a calculation network -which is a sort of function tree with table valued parameters. Calculation networks will be a feature of our (upcoming) commercial product finaquant® calcs. This is a relatively complex feature that will probably be required for only advanced scenarios. This entry was posted in Finaquant news. Bookmark the permalink.